In the 1980s, a new class of thickeners, i.e., associative thickener (AT), was introduced for water-based coatings to improve their rheology. Principally, they work by associating with polymer particles present in the paint. Manufacturers of ATs provide some generic guidelines to choose them based on economy, regulatory restrictions, and polymer type; however, it is very difficult to choose suitable ATs until and unless their interactions with polymer particles are studied by rheology. This article focuses on developing a rheological approach to identify a suitable AT for a paint formulation. In this approach, a rheology viscosity curve was used on AT–emulsion polymer mix and AT–emulsion polymer–surfactant mix to short-list a suitable AT. Subsequently, the shortlisted ATs were tested in the paint formulation to study their efficacy. Commonly used, hazardous air pollutants (HAPs)-free, commercially available ATs, viz. 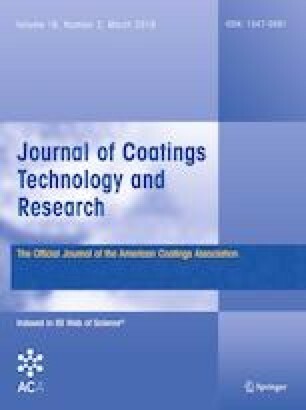 hydrophobically modified ethoxylated urethane thickener (HEUR) and hydrophobically modified poly(acetal- or ketal-polyether) thickener (HMPE), were selected to study their interaction with a unique surfactant-stabilized acrylic–polyurethane hybrid emulsion. A range of acrylic–polyurethane hybrid emulsions were prepared by increasing the polyurethane content in the emulsion. As the polyurethane content increased in the emulsion polymer, the thickening efficiency of AT decreased. Authors are thankful to Asian paints management for giving permission to submit this paper for international publication. Authors are also thankful to Mr. Girish Gurjar, Mr. Vijay Shigwan, and Mr. Sushant Barve from Modern Instrumentation Laboratory for their help in FTIR, PSA, and DSC. Thanks are also due to Dr. Subrahmanya Shreepathi, Dr. Sisirkumar Mandal, Dr. Subarna Shyamroy, Dr. Raja Krishnamurthy, and Dr. Venkata Chada for their suggestion and encouragement.